I just received another prize a won! Because I recently wrote about how I won a prize from Instructables I feel like I'm on lucky strike here! I won a completely new Arduino the MKR1000. Arduino have partnered with Atmel, Adafruit, and Microsoft and they are hosting the Worlds LargestArduino Maker Challenge. Here I entered by pitching my idea for what I would like to make with the new Arduino board. The idea I pitched was for a DIY Plant Stick. 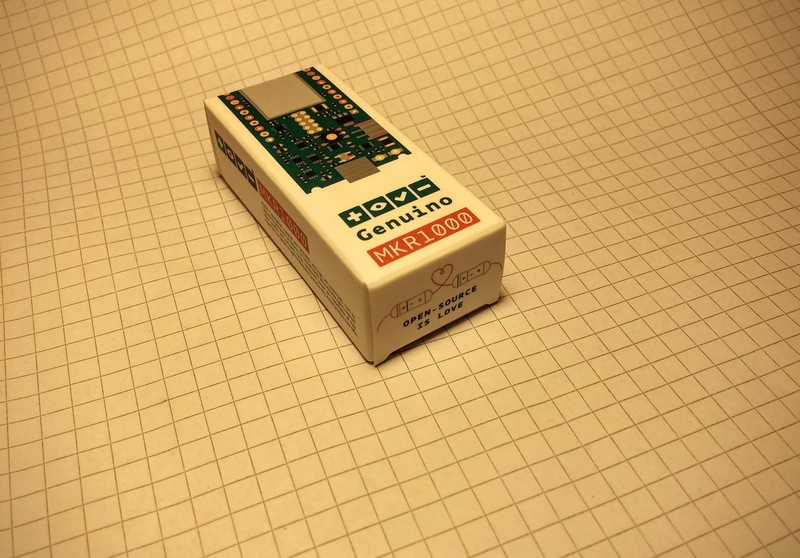 The MKR1000 is not yet commercially available but you can read the technical details here. What's really got me excited is its tiny form factor, the built in WiFi chip and the on-board Li-Po battery charger. The team over at Arduino asked us to not yet share any detailed pictures of the board. This is because it's an exclusive pre-release version of the MKR1000. They said they didn't want third parties to start designing components for a boards that likely will change before final release. The box. It's not much bigger than a regular match box. I really want to use the MKR1000 to make a plant stick. With this I mean a small stick filled with electronics made to monitor and give essential feedback on plants growing indoors, like small indoor kitchen gardens in urban environments. So what is included in this plant stick? The idea I've played around with is this stick you put into the soil of your plants, and then it monitors different parameters of your plants, which are then sent to the cloud. * Light level. This parameter will also trigger a relay for a grow light to make sure the plants receive enough light throughout the day. * Internet. This is the most exciting and why I'm really looking forward to work with the MKR1000. I will use the internet to connect to Windows Remote Arduino. This will allow people to log and analyze trends for the plants. This is also what will streamline the whole indoor gardening practice. I won a prize from Instructables! Now, a while ago I wrote about how I made my own DIY Grow Light. Along with that blog post was the link to a instructable entry I had made. This contained all the details on how the light was made and how other people can make their own. I entered this instructable in a contest they were running at the time, the theme of the contest was Indoor Gardening. Well apparently enough people liked my design and solution so I won third prize in their competition. 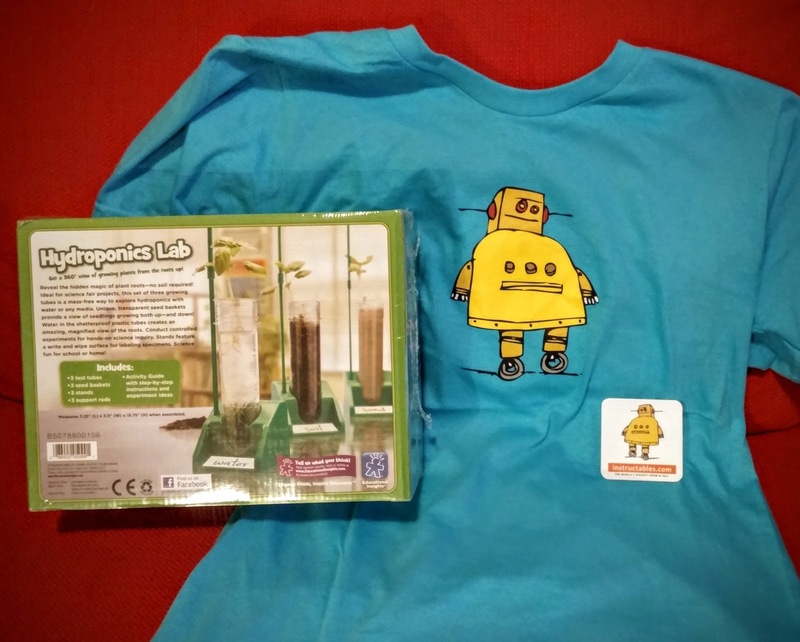 I just received my prize and keeping with the theme of the contest, I received a Hydroponics Experiment Kit. This kit is meant to experiment with different growth solutions for plants in hydroponics. Hydroponics in a couple of words, means growing plants in a water and nutrient solution instead of using soil. Also in my prize pack was an instructables t-shirt and a couple of stickers. All in all it was really fun getting recognized for one of my projects.